At Synapse, we know that good mid- to long-term electricity planning cannot be done without considering the trends in other energy sectors that impact electricity consumption. Widespread adoption of electric vehicles and high-efficiency electric heat pumps for residential heating are just two examples of developments that can shift the trajectory of electricity consumption and the resulting greenhouse gas emissions. We developed our inhouse Multi-Sector Emissions Model (M-SEM) to provide a more comprehensive picture of future emissions across all energy sectors and to enable economy-wide screening of a wide variety of emissions reduction options. Based on publicly available data and easily integrated with Synapse’s other modeling tools, MSEM allows us to construct a reference case based on historical data and future projections at the state level. We use that reference case to test different shifts, policies, and cross-sector interactions for use in parallel with more detailed electricity sector modeling. In essence, the tool lets us compare apples to apples: First, it gives us calibrated common units for all sectors so that we can transparently synthesize data by end-use, by sector, by state, and by fuel type. With these results, we can tie historical data to future trends for energy use and resulting emissions. State and regional emissions reduction planning: As climate policies evolve, policymakers are finding that they’ll have to go deeper to meet targets than is possible with just electric-sector reductions. We use M-SEM in combination with a marginal abatement cost analysis—a list of emissions reduction resources ranked by cost—to provide a window into cross-sector impacts of policies with a clear view of which policies work. Enhanced electric-sector modeling: M-SEM works in tandem, in an iterative process, with the other tools Synapse uses for detailed electric-sector modeling. These tools include a Synapse-adapted version of the National Renewable Energy Laboratory’s Regional Energy Deployment System (ReEDS), our in-house Clean Power Plan Planning Tool (CP3T), our in-house Coal Asset Valuation Tool (CAVT), and a Synapse-adapted version of EPA’s energy efficiency savings tool. 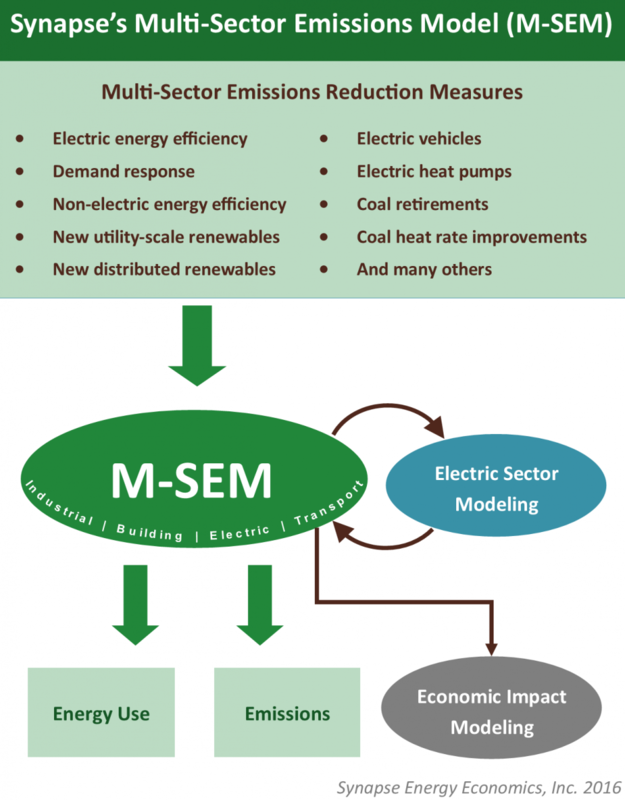 Detailed representation of the transportation, buildings, commercial, and industrial sectors: M-SEM models economy-wide energy use and emissions reductions by capturing critical interactions between sectors. We model electrification of transportation, space and water heating, and industrial energy in terms of both (a) emissions reductions from lower direct fuel use and (b) impacts of increased electric demand on generation and electric emissions. Energy and environmental stakeholder engagement: Public interest groups working to improve energy and environmental policies need access to transparent multi-sector analyses to inform policy recommendations and understand the impacts of proposed actions. Projecting clean-tech industry impacts: Industries closely tied to electricity consumption, such as the electric vehicle industry and energy efficiency technology providers, can benefit from a deeper understanding of how their industries interact with the electric sector. M-SEM is also designed from the ground-up to easily interface with IMPLAN, a model used for exploring jobs and GDP impacts of emission reduction policies. In its January 2016 and March 2016 reports Synapse used M-SEM together with the National Renewable Energy Laboratory’s (NREL) ReEDS model to explore the impact of policies that can help the Regional Greenhouse Gas Initiative (RGGI) states achieve steeper emission reductions by 2030. Synapse found that the nine RGGI states could achieve economy-wide emission reductions 40 percent lower than 1990 levels by 2030, at a net benefit of $26 billion over 15 years. Read The RGGI Opportunity at www.synapse-energy.com/RGGI-Opportunity. In this webinar, Synapse panelists Dr. Elizabeth A. Stanton and Pat Knight walk us through a case study using M-SEM to conduct an analysis of deep, economy-wide emissions reductions for the states in the Regional Greenhouse Gas Initiative (RGGI).